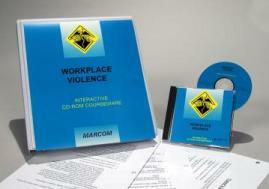 MARCOM's "Preventing Workplace Violence" Interactive CD-ROM Course shows employees how to recognize the warning signs of possible violent behavior, as well as how to avoid or defuse potentially dangerous situations. One out of every six violent crimes occurs in the workplace. And while workplace homicides grab the headlines... (homicide is the second leading cause of death on the job and the number one killer of women in the workplace)... other forms of workplace violence happen much more frequently. No organization, regardless of its size or type, is immune to workplace violence. Areas covered in the course include the nature of workplace violence, underlying causes and warning signs, aggressive behavior, threats and verbal abuse, sexual harassment, physical assault and armed assailants, fostering a positive workplace environment, and more. Using a powerful combination of audio, full-motion video, text and colorful graphics, this course provides the most cost-effective safety and regulatory compliance training available today. The course is divided into a number of logical sections so information is easily understood... and retained. Also designed with the training manager in mind, all courses in the Interactive CD-ROM Training Library include a learning management system (at no additional cost). Using this system, trainers can set up "Pre" and "Post" tests... establish log-in procedures... even define and set up curriculum for various job classes. The system also collects and organizes employee performance information through a powerful relational database, which can generate a number of record-keeping and tracking reports... and has a database "import/export" feature, which allows information to be transferred to and from an external database (such as a company's personnel database). The course is one of over 100 titles currently available in the Interactive CD-ROM Training Library.